Terry Funk, is that you? I remember the day of Chainsaw Charlie's debut foundly.It was December, I was at my mom's friend's house and at it where other kids who just so happen to be fans of wrestling like myself, and they were into the "don't try this at home" moves. Man, I remember all the moves and submission holds we did on each other that faithfull night when RAW was on in the background. Armbars, surfboards, sharpshooters, belly to belly suplexes, and Texas cloverleafs... Texas cloverleafs everywhere. But there came a sudden chill in the air and thing seem to turn eerie out of nowhere as the loud buzz of a chainsaw came booming from the speakers of the TV and it all of a sudden had our attention. I don't recall Chainsaw Charlie ever having a singles run but he did tag team with Cactus Jack where they feuded with then tag team champions:The New Age Outlaws, which was pretty entertaining stuff. Long story short a dumpster was sort of of the main focal point of all this. It was even implemented in Jack and Charlie's championship match at Wrestlemania, which they won and only held for a day for the lost them to their rivals in a rematch. 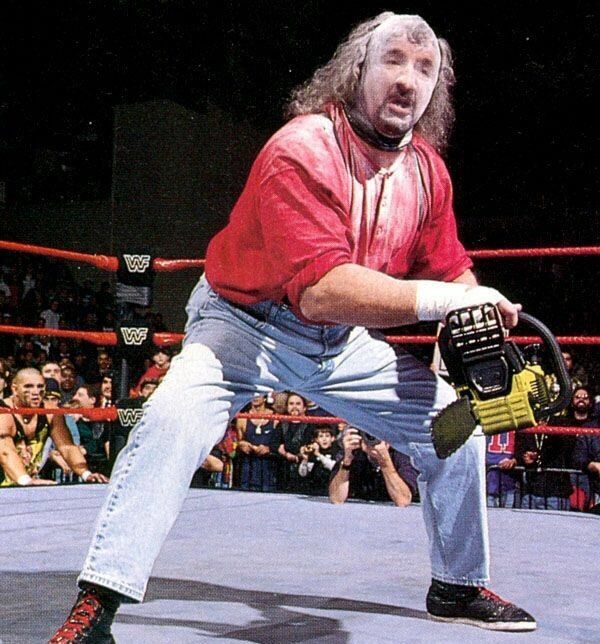 Chainsaw Charlie was a very interesting character for the short time the character was in WWF (now WWE) but truth be told there's an even scarier chainsaw wielding monster of wrestling that was in another promotion in the land of the rising sun. A true monster heel that really made the attending crowd run out of the stadium in legitimate fear.